A San Francisco cable car holds 60 people. This blog was viewed about 980 times in 2014. If it were a cable car, it would take about 16 trips to carry that many people. A bit sluggish for my liking so we’ll have to up the ante in 2015. Happy holidays to all! Five Big Ideas for Effective Teaching: Connecting Mind, Brain, and Education Research to Classroom Practice. Donna Wilson and Marcus Conyers. Teachers College Press, 2013. Years ago while still teaching at a school in Los Angeles, a colleague of mine championed any professional development opportunities to make connections between neurological research and understanding how students learn. Many of the articles she encouraged me to read did, in fact, open my eyes to thinking more broadly about how my students might better acquire new knowledge. Like my former colleague, authors Donna Wilson and Marcus Conyers clearly see connections between the brain and learning. This may seem like an obvious statement yet, as the authors successfully argue, there is a need to explain kinship between the brain, its functions, research, and teaching. In addition, such connections need to be presented to pre-service and professional teachers in convincing and clear presentations. In many ways, Wilson and Conyers succeed on this front. The big ideas are discussed in detail in separate chapters organized around questions intended to help focus readers and including sections that provide emphasis on a variety of key points. In addition, the text includes chapters on the challenges and opportunities of education in the 21st century, myth busting as an educator, and the forward nature of continuous learning. The five big ideas focus on the nature of neural plasticity (flexibility of the brain in terms of learning), recognizing human potential, understanding the nature of intelligence, how body movement can link to learning, and understanding concepts of metacognition. A particularly important idea to embrace in successful teaching is to not have a fixed mindset about human potential or the nature of intelligence. Modeling a “growth” mindset is important to show students how everyone can continue learning, including teachers. Such modeling can be seen in teachers who demonstrate high standards, nurture students, focus on ideas like mastery, use formative assessment, and emphasize development of thinking skills among other ideas. This third “big idea” for teaching is an essential component of successful teaching. The teacher whose mindset remains fixed cannot bend or grow with their class. If the teacher won’t advance their own mind, why should the student? A weaker aspect of the text are the “Perspectives on” dialogues that create conversations between fictional teachers in order to explain conflicting attitudes toward the big ideas (this is particularly true in the body-brain chapter). This method, while common in a number of texts about education, rings false. Perhaps reshaping these conversations as dialogue between real teachers presented with the concepts explained in the chapter might be more powerful. In addition, by using real people, the nature of debate and disagreement about teaching and learning could be viewed more clearly. I found the “from teachers to teachers” more helpful. These vignettes provide real case studies of how teachers are using some of the discussed strategies in practical, meaningful ways. I’m also not convinced by some defense of the Common Core standards that appear in the text (pp. 135, 143). Overall however, the text provides some useful links and suggestions for how to improve teaching. To this end, I found the section covering the idea of metacognition, or, “thinking about thinking” particularly fascinating. When assigning complex tasks to students (eg, interpreting documents or writing an essay), metacognition demands that students consider how they go about these tasks and in what order (pp. 117-119). Each step becomes possible to complete, building toward the end goal and allows students to assess their progress along the way, seeing how and where they might improve. Such approaches allow teachers and students alike to see where structured support or perhaps research might aid learning. Finally, metacognition should work successfully in enhancing both student peer appraisal and teacher-directed suggestions and evaluation. Readers will note that I’ve been working on shaping up a conference paper I delivered last January at the American Society for Church History conference for submission to journals. (See the abstract here.) The writing group with whom I am working this semester has been extremely helpful in keeping my ear to the ground for making adjustments to my piece. Below is a current proposed “re-organization” model for the paper. We’ll see how closely I hold to it in these final weeks prior to submission. A. Personal background – should be extended? A. Does this contradict or reinforce historians’ debates about missionary work? Self-Assessment – paper needs significant revision and tightening; if purpose is to use the Merrill and Allis missionary work as an example that fits within larger conversation about historians’ analysis of missionaries among natives, then the purpose section needs reworking; current section 7 should be elevated to earlier in the paper? Background on Nebraska and the native people in general might be lifted or restructured? Make connections between Coleman’s call for more individual missionary studies and what I am proposing here more obvious? Tie the observations about Merrill and Allis to historians like Tinker, Rollings, Fisher, etc. Alan Furst, Midnight in Europe, 2014. Alan Furst’s latest period spy novel, Midnight in Europe, caught my eye quite by accident while I was at my local library in early October. I had not remembered that Furst had published a new book in his long-lived World War Two era “series” last June, so when I saw the cover I thought “well, that looks like a Furst,” and sure enough, it was. As I’ve mentioned before, a colleague introduced me to Furst and I immediately was taken in by the characters, environs, and the era. As a student and instructor of history, I’ve long been fascinated by compelling and successful novels that help illustrate a period in time. Alan Furst creates, not unlike John le Carre, vivid worlds of espionage, secrets, failed trust, and lovers. Midnight in Europe is no exception as we meet Catalan refugee Cristian Ferrar, international attorney and Parisian resident, along with former arms dealer Max de Lyon, and a host of other characters, some new, some familiar. Furst populates his novels with people and locations who “overlap” one another, so in Midnight we re-visit Brasserie Heininger and spend time with Count Polanyi, a Hungarian diplomat. It’s rather like re-visiting a comfortable neighborhood, even in cases when Furst is laying the base for some very tense story-telling. While Midnight did not impress me the same way in which earlier novels like Night Soldiers or The World at Night did it still allows one to envision pre-World War Two Europe in all its romanticism and tension. Ferrar’s trips into Nazi Germany, his planning for the future as his homeland (Spain) falls to the fascist Francisco Franco (who is these days, is still dead), and the introduction of the United States more fully into the story line are all intriguing. Part of what Furst has done successfully over the years is give readers insight into the lives of those at the fringes of the “typical” World War Two narrative. So in Midnight we meet a Catalan, Spanish citizens fighting off fascism, a Russian Jew who has lived all over the continent, Greeks, Hungarians, and more. These individuals are all facing the coming changes in mid 1930s Europe and, in some instances saying their farewells – it can be touching how Furst portrays these tough men (laborers, criminals, dockyard workers, etc.) acknowledging that their homes are about to explode and many may never see one another again. One could do worse when trying to unravel interwar politics than to pick up books such as Midnight. postscript – I’ve also been reminded that the BBC produced a version of Furst’s Spies of Warsaw starring David Tennant as the lead. Seems as though I need to check out Hulu+ and give the series a whirl. October is apparently “Connected Educator Month” so it seems appropriate to add to our Westfield State blog on technology by briefly discussing the use of blogs in academia. Inspired by Worcester State history professor Tona Hangen, I returned to using blogs as a writing platform to discuss my thoughts on books, teaching history, my role as a union representative, and the odd “popular culture” thought or two. I had experimented with blog use in my high school classrooms while teaching in Los Angeles, and then used a similar setup when I first arrived at Westfield State for my US History survey courses and my American Colonial history class. I found the tools worked to mixed degree of success due to an existing online platform used at Westfield State. I migrated most of the assignments to that location, providing a digital home for my classes and the basic platform of what became some online course. At any rate, Pr. Hangen’s blog (links below and mentioned on previous blogposts) is an exemplar of academic blogging. The site expertly combines her teaching, research, and public outreach interests. I have used her academic blogging as a framework for my own. Below the links to Pr. Hangen’s material, you’ll see a few other links to materials from other sources on the nature of blogging in the classroom and academia in general. Happy experimenting! I must begin this commentary with a caveat – I have been a fan of U2 for over half of my life and they remain, for me, an important musical group even as my own tastes and interests have evolved. The band has produced some wonderful albums, some raw albums, and some clunky songs since their first full release, “Boy.” What they have not done, in my opinion, with the exception of their 2009 release, is release music that people largely ignore. “Songs of Innocence” should not be ignored for a variety of reasons, not the least of which is its ability to make listeners feel something rather strongly. 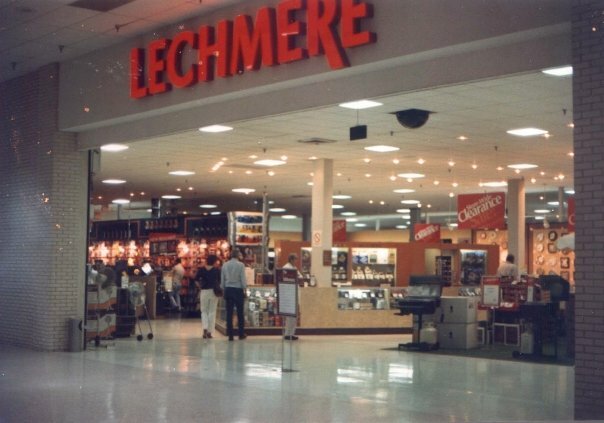 About thirty-two years ago I walked into the store pictured at the top and made a choice between two albums based on very different criteria. 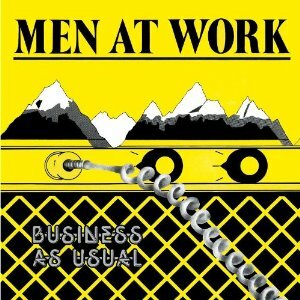 One, Men at Work’s “Business as Usual,” had familiar songs, catchy tunes, and extensive radio play. The second, released in the United States about a month earlier, was U2’s “War.” I knew nothing about U2 – I had not, to my knowledge, heard a single song of theirs in my entire life. But that album cover. Of course, I chose the album I knew and happily listened to Colin Hay sing about fried out combies and men from Brussels. As it turns out, the non “top 40” songs from that album? Rather good actually – “I can see it in your eyes” is a catchy song about the lover that gets away and I enjoy “Touching the Untouchables” and “Down by the Sea” which are bit odd and almost dystopian in some respects. But that album cover. 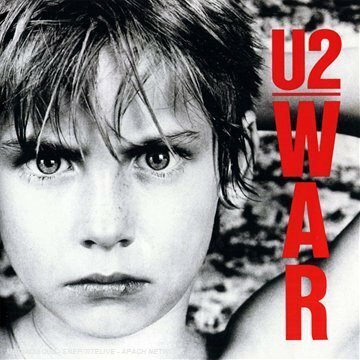 U2’s “War” cover art haunted me – I would think about it and the potential music that lay within. “What’s up with that kid?” “Is this related to Lord of the Flies somehow?” “Should I have taken a chance on that album?” I didn’t know the answer to the question, I STILL hadn’t heard a single song from them, and yet I was somewhat obsessed. The decision also caused me to rethink how I chose albums and made me ask questions like “what will the future me listen to? Will I grow as music evolves?” This latter question was particularly important to me given that I had spent an inordinate amount of time in elementary gym class listening to disco (not by choice). For the next several years, I often looked at compelling cover art as a potential deciding factor. This strategy did not always go well. But, around 1987 it netted me an interesting record by Canada’s Rock & Hyde and I got Public Image Ltd. “Album” that way as well. ANYWAY – it would be nearly three years (and one more U2 release) before I finally could say with absolute certainty, “yes, I have heard their songs.” My older classmates in high school were playing songs from “War” and “Unforgettable Fire” at a fund raising event for our school choir. Hearing “War” for the first time, and recalling the debate with myself in 1982, I became pretty hard on myself for my decision to go with Men at Work. “Songs of Innocence” comes to listeners five years after the previous full album release, “No Line on the Horizon.” The latter was, for me, a disappointment. Last spring, I gave it a listen again at the recommendation of some folks from the venerable Facebook crowd – while it sat better with me this time around, it did not hit me on the second hearing the way “Pop” did. I think I wanted more from “No Line.” I had heard rumors about work in North Africa and a variety of producers that might reinvigorate the sound and the album simply felt flat on those first few listens, never quite recovering for me. Look – it’s a marketing ploy, I get it, but if “the Fly” has taught us something at least since “Rattle and Hum” it’s that branding and marketing can give you power to say something and do something maybe a little different. If “Joshua Tree” doesn’t explode, do they get to make a vanity project like “Rattle and Hum?” If “Achtung Baby” doesn’t resonate with an American audience largely unprepared for German discotheque inflected production qualities, does the sneaky “Zooropa” get made? “Songs of Innocence,” for me, is not unlike the experience I had with “Joshua Tree,” with “Achtung Baby,” with “Zooropa,” and with “All that you can’t leave behind.” I put it on the day it “released” and I haven’t turned it off. Again, the caveat – I’m a fan. I like the band, I like that they’re still together and have been friends for going on forty years, I like Bono’s sanctimonious nature, I like Larry Mullen Jr.’s predictable backbeat. I like that the Edge has made a career as THE guitarist in the group but is basically a rhythm guitar guy who loves to manipulate sound using electronic tools. I really like Adam Clayton’s consistently aggressive bass. They’re not the greatest, most creative group necessarily – in a way, they are often, “straight pop” with many releases, but for me, that’s ok. If I want fractious, perhaps edgier, and creative, I’ve got the Smiths (I mean, Johnny Marr is, to quote Noel Gallagher, a f$*@*ng wizard – “even Johnny Marr can’t play as well as Johnny Marr”), Bright Eyes, Radiohead, the The, Arctic Monkeys, Franz Ferdinand, the National, Band of Horses, Cults, the Antlers, the Decembrists, Broken Bells, and many more groups to channel. Some people aren’t going to like aspects of this album or perhaps the method of its release, or the songs, or whatever. Still, U2 are making music that, to me, is interesting even as they approach their mid-50s. There are spots in the lyrics that mix well with the music and create powerful visuals (“Every Breaking Wave” – every sailor knows that the sea is a friend made enemy, and every ship-wrecked soul knows what it is to live without intimacy) and there are straight pop rockers like “Volcano” that gives Clayton a spotlight. Then there are other, deeply personal revelations that break your heart if you’re at all human (“Iris” – I’ve got your life inside of me….Iris standing in the hall, she tells me I can do it all, Iris wakes to my nightmares, don’t fear the world it isn’t there). Some people won’t appreciate what Bono is taking the time to tell us here – that even as a man of now 54, he can still channel the fourteen-year old boy who lost his mother too young. May none of our children feel that kind of pain. What makes a good pop album? I would argue that you can listen to it and you don’t want to skip out or turn it off or get out of the car. Another sure sign? My six year old knows the names of the songs already, sings along with some of them more than he does with songs from “Frozen” or even Minecraft parody songs (thank God), and my nine year old is curious about the choice of wolves as a lyric in the painful, yet still poppy song about living in a country tearing itself apart with sectarian violence. “Songs of Innocence” resonates with them hipsters; give it a chance. Today’s post is an exercise engaged with the writing process I am following this semester based on a campus writing group and Wendy Laura Belcher’s workbook on creating journal articles. Submission of the full-length version of this paper is one of my projects for the semester. Below is a draft of an abstract based on this paper (originally presented at the American Society for Church History conference in January 2014) . Writing and revising the abstract was an exercise for this week. What I am posting is abstract 8.0, and I’m certain it needs some additional revision but hopefully readers can get the gist of the paper from this piece. For native people as a whole, one must wonder, what was the appeal of Christianity or American civilization at all? How might access to this new faith and/or new products enhance people’s lives in any way? Would, as historian Willard Rollings describes, “individualism” hold a torch of progress aloft for Native Americans and how might one define “progress” in the first place? In the last thirty-five years, historians Michael Coleman, James Ronda, and James Axtell have all called for fresh examinations of mission history – the former encouraging critical case studies of individual missions and missionary societies. The latter two, along with Tinker, see missions as culturally revolutionary and seek to focus attention on native responses to such intrusions. This study seeks to ask questions about the experience of specific missionaries in the period of the Early Republic and whether these particular missionary experiences fit the model of “cultural genocide” as enunciated by Tinker. Allis arrived in Bellevue after the Merrill family did in 1834 and then moved farther west and served as missionary to the Pawnees until 1845. After 1845, Allis built and briefly ran a boarding school for natives before returning to the Bellevue area in 1851. Also in the 1830s, the Belgian Catholic priest Father Pierre-Jean De Smet conducted services and baptisms in the area, chiefly among fur traders, those of French descent, and certain natives who had taken on the Catholic faith. Men like Merrill, Allis, and De Smet thrust themselves into largely ‘foreign’ environments within the boundaries of property owned by the United States but contested by various native people. These frontier missions were both probes into native space and extensions of white American culture that differed from trading posts and military encampments. The missions, and those who ran them, sought to both build relations with native people and, in most instances, challenged and changed native culture. To that end, Allis went so far as to suggest that missionaries who committed to marrying into native tribes would have greater success. Despite this somewhat ‘radical’ thought, Allis also subscribed to at least one traditional approach. Conversion for natives was more likely to be successful once people like the Pawnees shed aspects of their lifestyles and came to mimic white farmers. Other missionaries believed that conversion had to come first in order to lead natives to civilization. Ultimately, disagreements over conversion efforts (style, sect, speed, etc.) led to debates and discussion as to the purpose and intent of white men such as Allis living among the Pawnees and other native people. In many ways, debates between some of the Christian missionaries and other Americans were more lively than any discussion between native people and missionaries in general. This is not to suggest that there was not some level of respect for native culture. Allis in particular was an admirer of the Pawnees and their ways of life, even suggesting that native people like the Pawnees had a lot more positive to be said about them then the white settlers who displaced them. Allis pointed out after two winters and one summer among the Pawnees that he had learned aspects of their language and culture in his time living among these native people, but also much about their character as fellow human beings. Allis and Merrill can be described as both sympathetic to their native neighbors and conversion targets, and still judging from their own world view. My reading of the experience of these two particular missionaries in Nebraska does not reveal a concerted effort at “cultural genocide” as Tinker might conclude. To successfully judge the Pawnees, Otoe-Missourias, and New England missionaries by their own standards, as should be done according to James Axtell, is difficult because we are examining a clash of two societies. This study focuses on the perspective of Allis and Merrill – the views of Otoe-Missourias and Pawnees living near the missionaries are only presented through the lens of their American neighbors. Here is where Tinker has a point – Allis and Merrill may have been well-intentioned, but their actions still, in the end, could be viewed as causing harm and perhaps, due to conversion efforts and cultural interchange, limit our ability to achieve Axtell’s vision of interpreting native society by its own standards. I would like to thank a number of people who have aided this project – panel chair Lindford F., panelists Joshua R., Brian F., and the audience at the ASCH session who all provided valuable resources and feedback to the original paper; writing group members Chalet S., Brian C., Cindy G., and Stephanie G. who all pointed out that the “lede” was buried! Thanks to writing group members Hillary S. and Joe C. as well for help with another matter on the native imagery project!